Recently, I was asked to talk about the panel with a painting of Elijah and the ravens in the south Transept of St Davids cathedral. [Fig 1]. While standing in front of it in the cathedral waiting for the group who had asked me to talk to turn up I was dismayed to realise that my thoughts about it had undergone a change since I last tried to make sense of the contradictory aspects of its design.1 I had concluded earlier, and I remain convinced, that it is not an icon painted by a Greek Orthodox painter in the 17th century or at any other time, as has been asserted in little notices placed near it in the Cathedral. For some time I have been constrained, by details of its appearance, to believe that originally it was painted to form the major element in the centre of an assemblage to be placed at the back of a Western European altar, a reredos. I was also impelled to believe that it was of British late medieval and possibly south Welsh origin. Talking about the painting while standing in front of the real thing on the wall it was disconcerting to realise that there are more ideas in it that might be derived from Byzantine sources than I had previously allowed and for some reason that is not immediately obvious, someone at some time had decided to convert a Catholic Gothic panel painting into an Orthodox icon of a Greek type. The survival of such a painting is remarkable and not the least part of its fascination is that it can be shown to have been precious to a succession of owners who were essentially collectors rather than religious people living in Pembrokeshire, Carmarthenshire, Cardiganshire and Nottinghamshire and then Carmarthenshire, and Pembrokeshire again. They owned it, for some of the time in secret, and each owner in his or her turn, must have cherished it for more than five hundred years in all. Then, when the last appreciative private owner could see no way to pass it on to another suitable private owner he gave it to the Dean and Chapter of St Davids Cathedral.2 It has ended up firmly fixed to the wall of the south transept, a place where it would never have survived if it had been placed there in the 16th century. Five separate incidents in Elijah’s life are described on the panel. The fifth, his reply to ‘the Lord’ after he had found a cave on ‘Horeb the mount of God’ recounted in 1st Kings 19:10 is written out on the scroll draped over him. The incident of Elijah being fed by two ravens takes up most of the panel area. 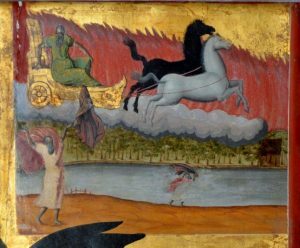 The two inset panels represent Elijah parting the waters of Jordan so he could cross with dry feet, and also leaving his mantle to Elias while ascending to heaven drawn by two flying horses. The restoration to life of the dead son of the widow of Zarapath is described in a small triangular shape half way down the right hand side and is readily missed unless the image is inspected very closely. The images are all depictions of events described in 1st Kings chapter 17, verses 1 -24 and 2nd Kings chapter 2, 1-14 in the King James translation. In other versions they are in 3rd and 4th Kings but the chapter and verse numbers are the same. Calling down fire from heaven on idolatrous religious activity described in 2nd or 4th Kings 1:3-15 is not shown. 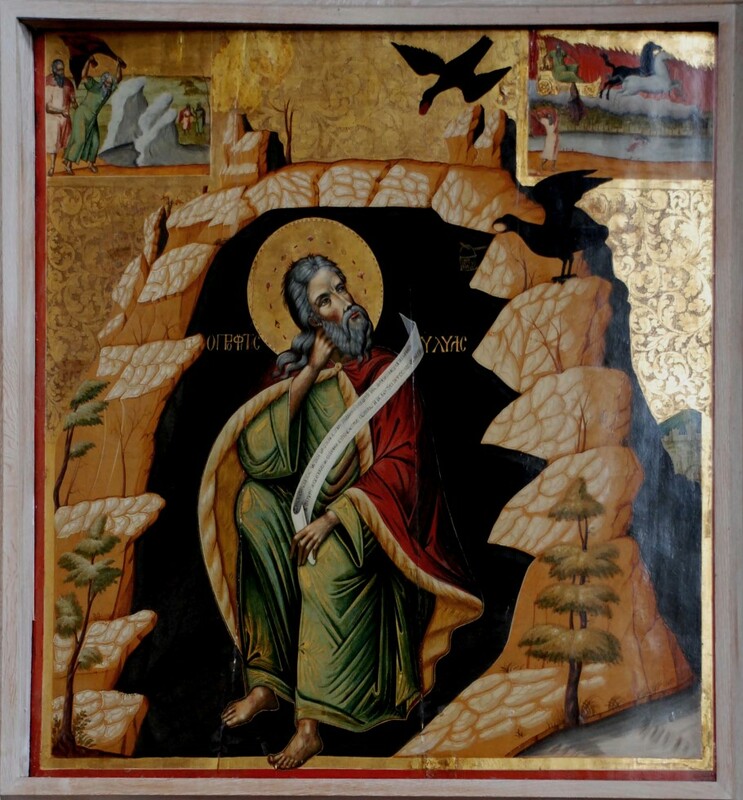 In the Byzantine and subsequent Greek Orthodox canon Elijah is always shown in positions consistent with received ideas about the way divinity communicates with men. This means fire descending from God to destroy evil when a seated Elijah requests it and ravens whispering God’s will in the ear of a standing Elijah. An early 15th century icon in a church near Thessaloniki and some later Serbian copies, now in various collections, in which a seated Elijah is shown turning away from the raven’s blandishments are different both iconologically as well as in design. 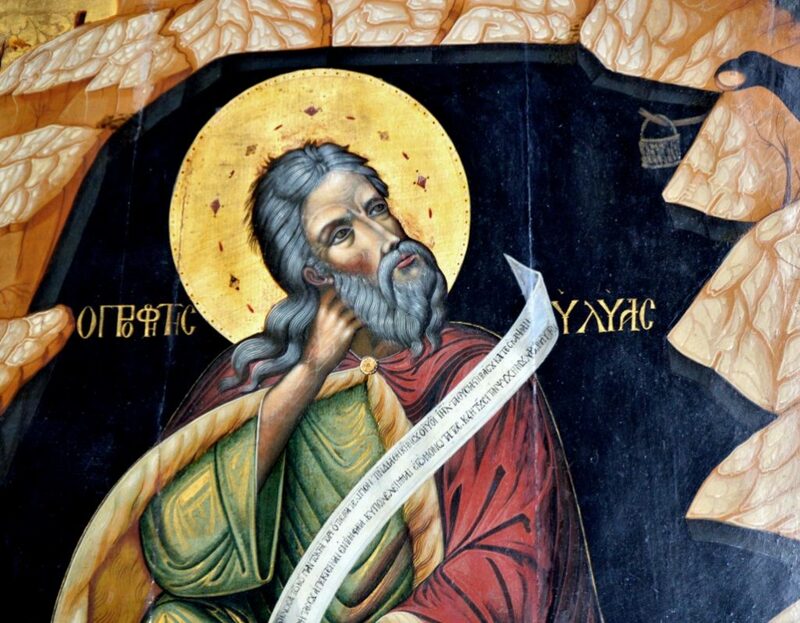 The Elijah panel is made up of two boards about fifty centimetres wide and a metre long. It is a pity that when dendochronologists working for the Royal Commission on Ancient and Historical Monuments Wales were recently dating the oak in the cathedral they were unable to remove the panel from the wall to see the back. They would have been able to make an incontrovertible identification of the timber. The species can be identified from the side and end grain of a plank but the identification is not as certain as it is from its width. Also, apart from being able to give a quite precise date for the felling of the tree from which the boards were cut the pattern of rings in oak can be used to identify the region in which it grew. However, even the observation that the panel is oak provides some information. Poplar is the wood preferred by Mediterranean painters for panels and pendunculate oak boards are chosen by north Europeans. Of the fifty nine paintings on boards by Netherlandish painters from the 15th century in the collection of the National Gallery in London all but two are on oak, mostly from the Baltic. A pair of poplar panels in the collection were both painted about 1475 in Urbino by Justus of Ghent for a commission from the Duke.5 It is therefore very unlikely that the panel for the Elijah painting was initially painted in the Mediterranean area even if a painter sympathetic to Byzantine ideals contributed to it. The paint on the Elijah panel is in three layers. Against the wood is a layer of white pigment, a calcium carbonate powder, ground into a water soluble adhesive medium. On top of this is a thinner layer of gold leaf and opaque pigments of various hues, also ground into a water soluble adhesive. Finally, there is an even thinner layer of varnish. The white priming is of sufficient thickness for outlines to be incised and patterned embossing to be pressed into it. It is therefore not Byzantine or Greek Orthodox work. Orthodox priming is thin. It just fills the wood grain and does not take an inscribed line or embossing. On much of the panel the pigments used are bound by some form of animal or vegetable glue thinned with water. It is a medium called tempera by Italian painters and gouache by the French. To stop it dripping off, dissolved in the damp of wet weather, the tempera is protected by a third layer, a varnish of polymerising resin or oil. 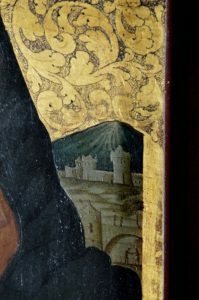 Stand oil, made from linseed or walnut oils partially polymerised by sunlight, was a varnish traditional in Byzantine painting but as it is difficult to remove when it becomes too hard, cracks and yellows,it is more likely that sandarac gum or a similar resins known from antiquity was preferred for the Elijah panel. Oil bound paints in which the pigments have been ground into a polymerising oil can be identified in the repainting of the widow of Zarapath incident and the large depiction of Elijah in the lower half of the panel. Oil paints are inevitably thick and sticky when first prepared and require thinning with additions of volatile oils such as turpentine if they are to spread as thinly and evenly as tempera. Thinners became generally available in the west after the Flemish painters discovered their effect in the early 15th century. Their use is not described in Byzantine and Orthodox documents, even in the ermhneia, cod. gr 708 in the State Public Library, St Petersburg, written as late as the end of the 18th or the early 19th century. While most of the pigments employed on the Elijah panel are substances available to painters who worked around the Mediterranean at any time after the 18th Egyptian Dynasty, there are pigments on the lower part of the panel that are anachronistic. The blue of the hill behind Zarapath is one such. It is typical of a ferrous ferricyanide pigment. It is a different colour from the natural indigo, the only dark blue available before the 19th century. The small triangular area of the depiction of Zarapath appears to have been painted at two different times and in two different ways. [Fig 2] The two strips down the side, one black and one golden yellow, indicate that the panel was mounted in first one and then another very much deeper and heavier frame than the one that surrounds it at present. The inner yellow strip that matches the yellow of the gold embossing, imperfectly conceals a bright painting of the walls of Zarapath that is a continuation of the sombre depiction currently intended to be visible. The black strip is continuous with the red lead strip elsewhere round the edge of the panel that would have been the adhesive used to fix it in its first frame. When the second inner framing was done is uncertain but it must have been after the widow of Zarapath incident was painted initially and before the glazing was done with a ferrous iron blue pigment. The crimson lake of Elijah’s robe has the colour reflectance of a precipitated aniline dyestuff. Aniline dyes were first made from coal tar in the 1830s and mauve, the first of the dyes reflecting some red, in 1858. The Byzantine or Greek Orthodox element in the panel was added after 1860. The lettering on the panel appears to be of Greek origin and is arranged in a layout consistent with a Byzantine icon. There is lettering on either side of the head of the large depiction of Elijah; there is lettering on the scroll draped over him and there is no other lettering elsewhere on the panel[Fig. 3.]. This distribution of lettering is consistent with other Byzantine and Orthodox panels but there the resemblance stops.The letter order frequently does not refer to Greek, Serbian or Russian words and some of the letter shapes are inconsistent with any letter in Greek or Cyrillic alphabets. The inscription oЃρoφitϊς γλγης behind Elijah’s head, for instance, ought to translate something like ‘The Prophet Elijah’ but does not. The first letter is a demonstrative pronoun and the remainder of the letter group on the left hand side, with a remarkable number of elisions, manages in the limited space available to read as ‘prophet’ with a Greek ending. In the second word the penultimate letter, which must be presumed to be an eta, is drawn reversed and two gammas separated by a lambda do not seem to represent any vocalisation that could be represented in English orthography as the initial three sounds of Elijah. The writing on the scroll is equally intractable but with the application of imagination as to the identity of some of the letters it was translated as “I am zealous with zealousness for the Lord God. For the children of Israel have forsaken thy covenant, thrown down your altars, slain your prophets with the sword, and I alone am left and they seek me to kill me.”7 Both inscriptions indicate that someone who was unfamiliar with Greek inscriptions painted them and as the remainder of the large image of Elijah is clearly the work of a competent craftsman it seems unlikely that he was a Greek but nothing in the script used or the information content presented provides any indication as to when or where the lettering was painted. The intention of a picture is its structure. It is created by the tension in its graphic lines, its rhythms and the projection that has been used in drawing or painting it onto a surface. In a design that involves three dimensions it is the masses, their orientation to each other and their inter-penetration. It is also the proportions, colour, texture and balance in both two and three dimensional representations. It is the way marks are organised to represent what the artist believes he has perceived visually. An arrangement of marks known as an orthogonal projection is used to draw the large depiction of the prophet in the Elijah panel. It is drawn as though the object has been seen from multiple viewpoints and all the sight lines are therefore assumed to be at right angles to the surface of the support. Orthogonal projections are a type of projection one form of which is used by architects depicting the facades of buildings since measurements of distances across a proposed facade can be calculated from the drawing. It is also the projection that is used exclusively in the painting and mosaics of Byzantine and Orthodox masters. The Byzantine master’s usage differs slightly from the projection employed in modern architectural practice, however. Some relief, some sense of solidity, is created, particularly in depictions of people, by contour shading. Tonal gradation is not modelled continuously across the form but represents those surfaces, which are round the periphery of the visible part of an object and are turned sharply away from the viewer, They are shown as darker than the surfaces that are plane to the viewer’s line of sight. There is therefore a tonal gradation round the boundary of each shape that is not present in an elevation from an architect’s office where it is the position of the occluding contour that is important. However, neither architect elevations nor Byzantine icons deploy so much tonal gradation on their drawings as does the draughtsman of the large drawing of Elijah on the St Davids panel. The proportions of the panels used to support Byzantine and Orthodox paintings and mosaics remain fairly constant throughout the whole period. For technical reasons due to methods of measurement for laying out buildings and parts of buildings inherited from Roman builders and surveyors and Egyptian builders before them, the proportions of panels and the positioning of the depictions of saints and other people for Orthodox ecclesiastical purposes are determined by one system of proportions. It depends upon the way right angles were set to make a corner. A rope with thirteen equidistant knots on it is used to make a 3:4:5 right angled scalene triangle. The ratio between a side and the hypotenuse of a right angled equilateral triangle, approximately 1: 1.4142, was established from it and used to plan the foundations of a building that was slightly longer than wide and consequently had an internal orientation. Extending these proportions to objects placed within the building results in the preferred height of Byzantine panel paintings being close to one and a half times the width. Other measures on the panel are determined by progressions derived by the same means. The St Davids Elijah panel is square, an unusual proportion for an Orthodox panel and the painter uses a system of proportions that is difficult to quantify but throughout employs measures that are close to those of Orthodox practice. The intention of his draughtsmanship is comparable to the intention of Orthodox masters but it differs from that of the draughtsman of the two small panels inset at the top of the large one. The prophets and the background in the ‘Parting of the waters’ image in the upper left hand corner of the St Davids Elijah panel [Fig 4a] and the prophets and the horses in the ‘Fiery chariot ascent’ in the right hand corner are different. [Fig 4b]. They are not projections on multiple parallel orthogonals like the large depiction of Elijah and the images made by Byzantine and Orthodox masters. In addition, the depictions of the prophets that are further from the viewer are drawn smaller and more indistinct than the same prophets in closer positions. In each of them a separate picture space is created. Each of them is drawn on a single view point rudimentary perspective projection, not a multi view point orthogonal projection. But it is in the way the solidity of the human forms is realised that the major difference from Byzantine intentions occurs. The forms are not contour shaded. They are lit from one side and the lighting is directional from the same single source in both inserts. Elijah dropping his mantle to Elias as he ascends in the fiery chariot. Fig.4a. Elijah Panel, Elijah parting the waters of Jordan. The light which shone through the great windows of painted glass that he had installed was real but it was also divine. By shining through the windows into previously dark and gloomy spaces it illuminated the story of the ministry of Jesus Christ the son of God on earth. Light for Suger is real perceptible energy. For the Orthodox the divine message is the Gospel chanted by priests and occasionally explained by them in common speech. It is necessarily inferred, from the use of light to unite the two small images and the other factors that constitute the intention of the whole work, that work on the Elijah painting was begun on the panel somewhere in north western Europe after the beginning of the 12th century. The catalogue of Christie’s auction on 14th June 1937 listed paintings belonging to the Earl of Lincoln including the Elijah painting that is now at St Davids. The entry gives an accurate description and refers to a possible Byzantine origin. In the auctioneer’s copy is the information in pencil that it was sold to a dealer called Sutch for £11.9 Sutch was acting on behalf of Herbert Lloyd-Johnes of Dolaucothi. In a speech he gave at a meeting of the Carmarthenshire Antiquarians later in 1937 it is made quite clear that he believed the panel he bought was given into the care of the family living at Dolaucothi on the dissolution of nearby TalleyAbbey.10 In the 1960s he gave it back to the Church by donating it to the cathedral. The Premonstratensian abbey churches throughout western Europe were, normally dedicated to the Virgin Mary and John the Baptist, presenters of Jesus to the world. Elijah the Prophet was held to foretell the coming of Jesus and therefore a fit person to put beside them but because his contact with Jesus was less complete he was less sacred and could be represented pictorially in an otherwise austere abbey. At the ruins of Talley today an unusual addition to the severely regular and austere cruciform plan normal in Premonstratensian abbey churches can be seen: the ruined outline of a large chapel extending eastwards from the north transept. It was not built in either of the first two phases of building at the abbey in the 12th century. It must have been inserted some time after the abbey church was completed and it seems likely that this chapel was part of a special gift. Rhys ap Thomas of Dinefwr was an ambitious and slightly unscrupulous magnate of some influence in south-west Wales in the second half of the 16th century. Throughout his career he called on the abbot and canons of Talley for assistance in writing politic letters. The choice of the Elijah panel for a reredos at the back of the altar in a chapel at Talley would have conformed to Rhys ap Thomas’s tastes as well as to his obligations. No other paintings are known to have been commissioned or purchased by Rhys ap Thomas. However, the carving on the Derwedd Bed, commissioned after he had given up soldiering on behalf of Henry VII from 1486 to 1497, and in France for Henry VIII in 1512 to 1513, and as a Garter Knight in 1505 had established himself at Carew Castle, is an example of his taste some twenty five years after he must have made a donation to Talley Abbey. The style of the Derwedd bed friezes is not unique to work commissioned by Rhys ap Thomas because it is also visible in occasional pieces of carving on woodwork and painting in 15th and early 16th century gentry houses in Wales and the Marches.14 It is a much less elegant design than for instance the design of most of the relatively few surviving British 15th century religious panel paintings and the illuminations in several English manuscripts of the 15th century including the illuminations of the Book of Hours that was found in the tent of Richard III after Bosworth. There the people depicted are engaged in less vigorous action than in either the Derwedd bed or the two smaller insets in the Elijah panel and are acting more decoratively and with more refinement. The comparability between the design of the Derwedd bed and the design of the St Davids Elijah does not of itself confirm any conclusion that Rhys ap Thomas commissioned the St Davids panel but it makes it very likely he purchased one that was available. The subsequent history of the panel after it left Talley and went to Dolaucothi is better recorded. When Thomas Johnes built Hafod Uchtryd, Cwmystwyth, Ceredigion, in the last years of the 18th century he persuaded the member of his family living at Dolaucothi to let him add the Elijah panel to his collection.15 B. H. Malkin, a visitor to the house in 1803 and subsequently Professor of History at the recently instituted University College, London, described a treasured painting in the library that was dominated by an Elijah and Ravens image and included within the frame of the main image two separate images of Elijah parting the Jordan and Elijah, Elias and the Fiery Chariot. It was undoubtedly the painting on the panel that is now in St Davids.16 He did not mention the widow of Zarapath but it is not conspicuous and is usually missed by all but the most intensive scrutiny. He was told by Thomas Johnes that the panel came from Talley and had been in the possession of the Johnes family since the dissolution. Accepting this, he speculated on how an early Italian painting might have come to Wales. Thomas Johnes died in 1816 and his widow Jane lived at Hafod until her own death in 1833. The house and contents were then sold into the estate of the 4th Duke of Newcastle.19 At some time before the duchy resold the Hafod estate the Elijah panel was taken to Clumber Park, Nottinghamshire. When that house caught fire in 1879 it was again saved but this time it must have been scorched sufficiently to require extensive restoration to the lower part of the paint surface. A painter and manufacturer of stained glass who worked for the 7th Duke of Newcastle at the end of the 19th century is the most likely person to have undertaken the restoration work. C.E.Kempe (1834-1907), was an eclectic painter and incorporated motifs from Renaissance German and Flemish masters in paintings on glass such as the east window of St Mary’s, Pembroke, and the glass for the large gothic revival chapel dedicated to St Mary the Virgin that still stands close to the remains of the house at Clumber.20 He was therefore quite capable of making an accurate copy of a late Palaeologue or Cretan painting of a seated Saint and adapting it so that it represented Elijah looking over his shoulder towards one of the ravens. But in view of his other known work he might have been expected to give it a more gothic look so the Orthodox reference was an intentional choice. The 7th Duke died unmarried. The estate passed to the son of a daughter of the 6th Duke – the Earl of Lincoln. He had the Elijah panel auctioned at Christie’s in 1937 along with other pictures from Clumber when the huge, rebuilt, 19th century house became too much of a burden to maintain and was pulled down. The oak boards comprising the panel, the materials used on it, the draughtsmanship and its documented and reputed history all contribute to an inference that the St Davids Elijah panel was painted by a medieval British artist, possibly an artist from South Wales. Modifications in the style of late Palaeologue Byzantine painting were added by a restorer to replace parts of the image in a fire damaged area. Since its known provenance and the wood used indicate that the panel has never been out of Britain or been worked upon by other than a British artist, the introduction of late Byzantine ideas must, therefore, have been for a purpose. Elijah’s reply to God in 1 Kings 19:10 in the Septuagint version clearly seemed important to the 7th , and last, Duke of Newcastle. It introduces verses 11 and 12 where it is shown that divine power destroys as well as creates and concludes with an indication that injunctions to man are a ‘still small voice’. It is a demonstration of the characterization of divinity which the Orthodox Church recognised early and has subsequently sustained but is less compatible with the north-western European medieval militarist ideals that survive to the present day. The St Davids Elijah Panel, and The Derwedd Bed, in Derwedd House were all photographed by the author. The Elijah panel and details with the permission of the Dean of St Davids. 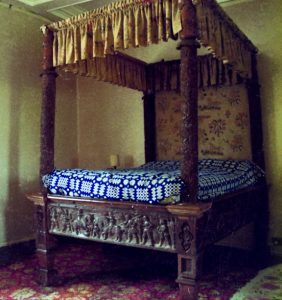 The Derwedd bed with the permission of Mrs Stepney Gulston. The detail of the panel at the bottom of the bed is © The National Museum of Wales. 1.Eastham, Michael, 2005 ‘The Elijah Panel in St Davids Cathedral, Pembrokeshire and its Provenance’ Archaeologia Cambrensis, Vol. 151 (2002) 19-40. In it I summarised conclusions that I had arrived at as much as ten years previously. Evans, Wyn. St Davids Cathedral, (Andover, Pitkin Press. 1991). Hetherington, Paul, The Painter’s Manual of Dionysius of Fourna,(London, Saggitarius. 1974). Winfield, June and David, Proportion and Structure of the human figure in Byzantine wall painting and mosaic. ( Oxford BAR. 1982). Campbell, Lorna, The Fifteenth Century Netherlandish School, (London, National Gallery Publications, 1998). Holt,Elizabeth Gilmore, Literary Sources of Art History, (Princeton NJ., Princeton University Press 1947) and Helen Howard, Pigments of English Medieval Wall Painting, (London, Archetype Publications, 2003). Naydenov, Evgeniy.1996, I contacted several scholars who specialised in Greek and Cyrillic encoding but they were unable to translate the text. Naydenov was not only able to translate it but he showed me the mistakes in letter forms and identified its origin in distinctive versions of the Septuagint. He suggested that the scripts used on the St Davids panel were copies of texts inscribed on an Orthodox icon. They were made by someone who was unfamiliar with the letter forms and without understanding of what they meant. He was probably unable to read them as the Orthodox icon was in poor condition and he made a poor job of copying them in consequence. Browne, Charles Gordon and James Edward Swallow ed. and trans. ‘Select Orations of St Gregory Nazienzen: sometime Archbishop of Constantinople’, in a Select Library of Nicene and Post Nicene Fathers of the Christian Church, ed. Philip Schaff and Henry Wace,(Oxford and London, Parker and Company, 1898). Particularly paragraphs III and IV of ‘The Fifth Theological Oration, On the Holy Spirit’, p.318. See also Gervase Mathews 1963 Byzantine Aesthetics,( London, John Murray). 23-29. Christie’s Auctioneers, Catalogue of Old Pictures, the property of the Honourable the Earl of Lincoln, (London, Christie Manson and Woods,1937). Lloyd-Johnes, Herbert, ‘Presidential Address’, Transactions of the Carmarthenshire Antiquarian Society,1937. Owen E. ‘A Contribution to the History of the Premonstratensian Abbey of Talley, Archaeologia Cambrensis, 5th Series 10: 29-47,120-128, 226-237 and 309-325. (1898) and Price F.S. A History of Talley and Talley Abbey, ( Swansea.1936). Griffiths, Ralph A., Sir Rhys ap Thomas and his Family, (Cardiff, University of Wales Press,1993). Bebb, Richard, Welsh Furniture,1250-1950, (Kidwelly, Saer Books,2007). 15.Vaughan, H.M. 1925, Some Letters of Thomas Johns of Hafod, (London Cymrodorian Society,1925). Malkin B.H., The Scenery, Antiquities and Biography of South Wales, (2nd ed., London,1807). Meyrick, S.R., History and Antiquities of the County of Cardigan, (London,1809-1810) and Rees, T., The Beauties of England and Wales, Vol. 18, (London, 1815). Johnes, Thomas, A Catalogue of the late Pesaro Library at Venice, (Hafod Uchtryd, Hafod Press,1807) and H.M.Vaughan, Some Letters of Thomas Johnes of Hafod, (London, Cymrodorian Society, 1925). Moore-Colyer R. ‘The Hafod Estate under Thomas Johnes, and Henry Pelham 4th Duke of Newcastle-under-Lyme’. Welsh History Review 8 (1976-1977), 285-297. Stamp, G. and A. Symondson, The Chapel of St Mary the Virgin, Clumber, Nottinghamshire, (London, National Trust, 1982). Fig.1. The Elijah panel St Davids Cathedral. Fig. 2.Elijah Panel, St Davids Cathedral, Zarapath, Elijah outside the gates greeting the widow and on top of the wall raising her son from the dead. Fig.3. Elijah panel St Davids, Head of large depiction and inscriptions. Fig.4a. 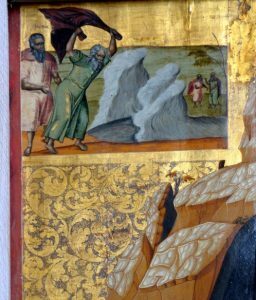 Elijah panel, St Davids, Elijah parting the waters of Jordan. Fig.4b.Elijah panel St Davids, Elijah dropping his mantle to Elias as he ascends in the fiery chariot. Fig.5.The Derwedd bed. To the left in a bedroom in Derwedd House. To the right a detail photographed by the National Museum of Wales prior to exhibition of the bed in St Fagans House.